Chelsea boss Antonio Conte became embroiled in a bizarre pitch battle after the Clarets held the Premier League leaders at Turf Moor on Sunday. 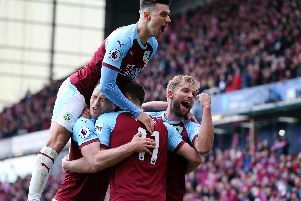 Robbie Brady’s magnificent free kick earned Burnley a deserved point, after Pedro’s early opener, as Sean Dyche’s side claimed a 29th home point of the season. Yet, at Stamford Bridge, the pitch is recorded at 103x67 metres, with Turf Moor actually 115x73m, having been extended in the summer to meet Premier League standard dimensions! Conte did go on to say: “There is a good atmosphere with the supporters and I think it’s good. “It’s right to have this type of atmosphere at Burnley and for all these reasons they have all these points in the table. Dyche took little notice of what could be perceived as another ‘long ball’ dig from an opposing manager: “Every manager has to give their opinion, I try to give mine about my team, but simplistic, or non simplistic, so far this season we’ve got 30 points, and that’s a fantastic marker so far. And he explained his way of trying to find a solution to the many problems sides at this level pose: “If we went into the Premier League and did what everyone else does, I don’t think we’d be as good at it as them. “So we do things they’re not used to, that make it awkward and different for them, that make it strange for them, and that’s a key thing. “I mention it many times, the brand of football I want to play is one that wins.